Shock Frontier is the death industrial project out of Pennsylvania manned by Kyle Carney and Robert Kozletsky. Many of you will be familiar with Kozletsky’s work on his dark ambient project, Apocryphos. 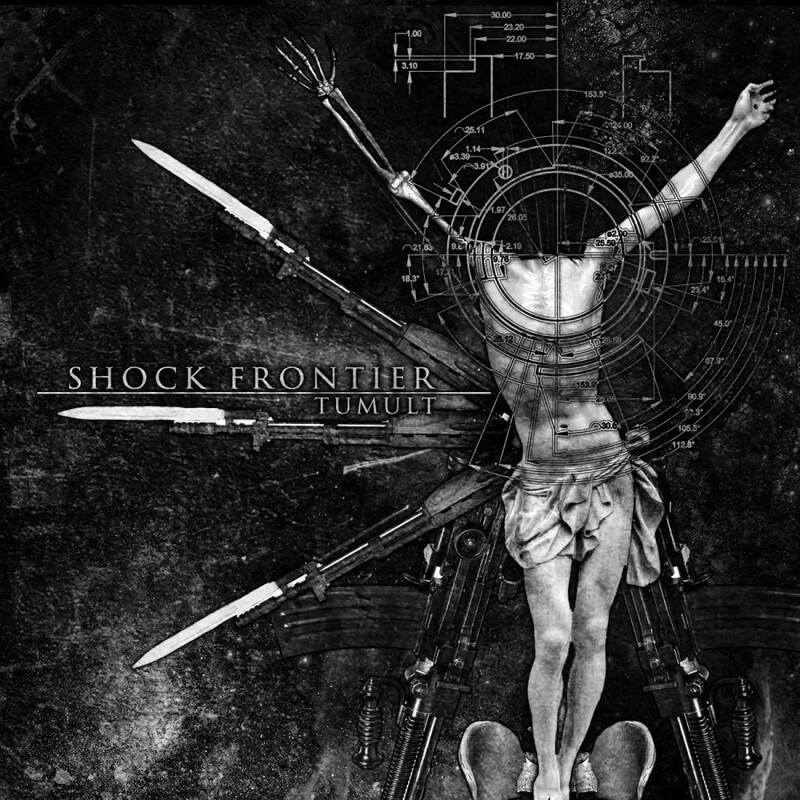 Shock Frontier, like many of it’s death industrial brethren, is a no-holds barred aural assault on the senses. The music is meant to make you feel the emotions of the artists, right down to your gut. This emotion can be wide-ranging in theme but is always on the negative side of the spectrum. Following in the footsteps of artists like Brighter Death Now and Deutsch Nepal, the death industrial scene has continued to grow over the last few years, with artists like Steel Hook Prostheses, Theologian, The Vomit Arsonist and Gnawed (just to name a few from the Malignant roster), continuing to carry the torch for the next generation of listeners. Shock Frontier garnered much acceptance after their debut, Mancuerda Confessions back in 2013, but their new sophomore release, Tumult, will likely bring them all due respect that they deserve. On their debut, Shock Frontier created incredibly harsh soundscapes which, frankly, had no need for improvement. So, instead of recreating their debut Shock Frontier decided to test new waters with their sounds. The most noticeable of these new elements will be the addition of vocals. The opening track, “The Cold Illucid World” introduces us to this new addition. We hear a sort of singing/yelling by Kyle Carney which introduces us to the themes at play on the album. As the track progresses the vocals slowly morph into all-out screams. While there is no traditional use of instruments like guitars or drums, the track still manages to have a sort of traditional song structure feel to it, which, as the album continues, corrodes further and further into the glorious depths of death industrial noise. The third track of the album, “Duress” is my personal favorite. It opens with this powerful passage, which I’m honestly not sure if it’s their own lyrics or a clip from a film. I’d like to think it is them! (but I’m guessing it isn’t) “You think god will protect you from the head of this hammer? Or the six floors you are about to fall? As long as there is a god, men like you can kill thousands, millions. But you will never find peace. Well… I guess were going to have to kill God. That is my message to the world. Kill God.” What follows is a repetitive harsh industrial percussion drowned in a tumult of electronic noise. Through the entirety of the track, we hear the words “Kill God.” repeated in various inflections and levels of intensity. As a whole, it makes for a beautiful cacophony of noise, which is utterly devastating and relentless. Another highlight is the closer, “Tumult”, which includes the talents of Kristoffer Oustad, as well as another spine-tingling sample of an older gentlemen speaking of what would seem to be their plans for a mass suicide… in the name of God… This track is one of the few throughout the album that have a bit lower level of intensity, holding the death industrial vibes while moving into sounds that are, at times, quite dark ambient. It leaves the listener with an incredibly uneasy feeling as the album reaches its close. Bringing in the talents of several other musicians (including Gnawed, Noculture and Kristoffer Oustad) to collaborate on a few tracks, Shock Frontier are able to further diversify their sounds from the previous release. What we are left with is a scathing look at humanity, through the eyes of people that have clearly had enough of the current trends and cultures that fill our modern planet. Themes of apocalyptic confrontations, mass suicides, and a corroded natural environment take listeners into the deepest darkest fears and sadistic pleasures mankind has to offer. Shock Frontier have absolutely proven their worth on Tumult. The album is challenging at times, but always at maximum intensity and always drenched in negative emotion, even during its more reserved, dark ambient leaning tracks. This new vision was given the full treatment by Malignant Records, housed in a beautiful DVD digipak with irradiated, irreligious, apocalyptic art created by Noculture. The sounds are mastered by death industrial veteran John Stillings of Steel Hook Prostheses. Kozletsky and Carney have bared their souls, grinding out tracks which surely took them into the darkest recesses of their psyches and Malignant gave them a platform to spill this deviant heresy on the post-industrial world. It is now left to us, the listeners, to share this dark beast with the unsuspecting masses. May they bask in its deviance… or crumble beneath its iron grip.